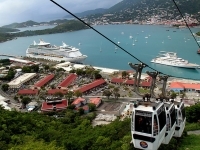 The best way to appreciate the stunning beauty of Charlotte Amalie and the St Thomas Harbour is from above. The idea for the tramway, which carries visitors over Flag Hill to Paradise Point, 700 feet (213m) up, began in the 1980s, when two ambitious businessmen bought more than 30 acres of Flag Hill from the Queen of Denmark. After a few setbacks, including Hurricane Hugo, the tramway opened in 1994 and has been a favourite tourist activity ever since. If visitors are fortunate enough to catch one of the last trams of the day, they will witness a magical vista of twinkling lights against the soft Caribbean twilight. At the top, there is a collection of unique shops as well as a casual restaurant perfect for watching sunsets while sipping a cocktail and listening to a local band. Paradise Point has been voted the best live entertainment venue and the best tourist attraction multiple times.